Most children, teens and adults in the United States don't get enough fiber, reports the 2010 Dietary Guidelines for Americans. A diet that lacks adequate fiber may increase your risk of high blood pressure, diabetes, stroke, heart disease, obesity, digestive disorders and cancer. While fruits, vegetables, beans, legumes and whole grains are natural sources of fiber, some commercial brands of yogurt include added fiber. Traditional plain yogurt does not contain fiber. By contrast, certain yogurt brands may have as much as 5 grams in a single serving container, or about as much fiber as you'd receive from eating one-half cup of cooked turnips, one-half cup of lentils or three-quarters cup of some bran cereals. Men need approximately 31 to 34 grams of fiber each day, and eating a container of fiber-enriched yogurt would supply about 15 to 16 percent of his recommended daily intake. Women need 25 to 28 grams of fiber per day. The 5 grams of fiber would fulfill 18 to 20 percent of her requirement. Manufacturers of yogurt with added fiber primarily use inulin obtained from chicory root extract as their fiber source, according to the Academy of Nutrition and Dietetics. Inulin is a type of soluble fiber. Soluble fiber absorbs water and slows the rate that food moves through the digestive system. Other types of fiber added to commercial yogurt may include synthetic compounds like polydextrose or maltodextrin and fiber extracted from sorghum, soy hulls or oats. Yogurt products containing inulin may not only help you reach your recommended daily allowance of fiber, they may also aid with weight loss by helping suppress hunger, reports University of Washington scientists in a study published in the "Journal of the American Dietetic Association" in 2009. However, yogurt with added fiber often contains high concentrations of refined sweeteners. Some brands may have as many as 16 grams of sugar per serving. Registered dietitian Keri Gans advises choosing a brand containing natural sweeteners, such as fruit, for fewer refined sugars. 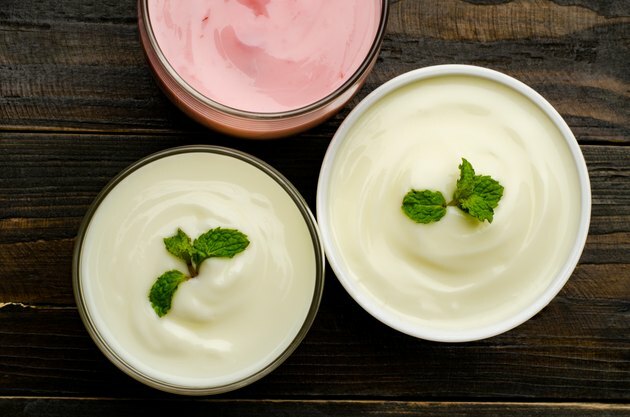 The ADA cautions that there isn't enough scientific evidence to indicate that relying on products like yogurt with supplemental fiber is completely safe and effective. Additionally, fiber-added foods lack the vitamins, minerals and antioxidants found in natural sources of fiber. You can still include yogurt with added fiber in your diet, but rely more on unprocessed fiber-rich foods. To make your own high-fiber yogurt, mix roasted, unsalted nuts and seeds, chopped fruit, low-fat granola, ground flaxseed or toasted wheat germ into plain low- or nonfat yogurt. Academy of Nutrition and Dietetics: Some Foods List Inulin as an Ingredient. What is Inulin?